• EW: Maps the horizontal plane in terms of East and West, this is the X coordinate. • NS: Maps the vertical plane in terms of North and South, this is the Y coordinate. • FB: Maps the depth of the plane in terms of Front and Back, this is the Z coordinate. When you add elements to a scene, they appear in layers in the initial position of zero fields NS, zero fields EW, and zero fields FB within the 3D scene space. Before the 3D space feature, you could only change the layer position—see . 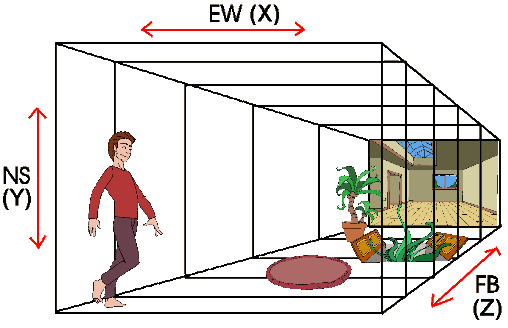 But in 3D space, you can use the EW (X), NS (Y), and FB (Z) coordinates to place your elements at different distances in depth from the camera and from each other, adding a three-dimensional effect to your two-dimensional animation. Once you place the elements in your scene, you can move, rotate, or scale your elements in 3D space. Storyboard Pro automatically applies the changes to all of the contents in the element.